Since its launch last Friday, The Dirt has come under fire from some quarters. 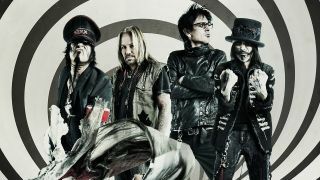 It’s led bassist Nikki Sixx to respond, saying that while the critics “hate it” the fans are enjoying the film. It’s a fact backed up by review site Rotten Tomatoes, which shows an overall score of 42% from the critics, and 85% from the general public. But drummer Tommy Lee has taken exception to one review in particular – Esquire’s which was written by Madison Vain. In her review Vain said that while The Dirt was “demeaning towards women” and condoned “outlandish rock’n’roll antics,” it didn’t go far enough in documenting their wild legacy. Lee tweeted Vain directly, saying: “Your review in Esquire of The Dirt was laughable. Jeff Tremaine and the cast killed it. It was our lives, we would know. The Dirt is now available to watch on Netflix and stars Machine Gun Kelly as Lee, Daniel Webber as Vince Neil, Douglas Booth as Nikki Sixx, and Iwan Rheon as Mick Mars. Find out what Classic Rock thought about the film.